> Products>RFID Antennas>Emitter Antennas>KGEA-MR (Integrated connector) Middle Range Antenna LF for smart entry system. 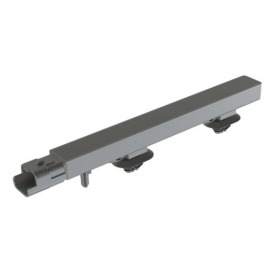 KGEA-MR KGEA-MR (Integrated connector) Middle Range Antenna LF for smart entry system. The Middle range antenna have been designed in order to reduce the number of antennas respect to the total number short antennas with equal or better performance reading distance and H-field around the whole vehicle. conditions, grade IP waterproof, mechanical robustness, etc.. PREMO offers from LPM technology, to Polyurethane, mixed LPM-resin and HPM. - Middle antenna (length until 200mm). - Anchor points (Clips and pivot). - High stability in temperature (-40ºC up to +85ºC). - Resonant frequency adjusting below +/- 2kHz. - This antenna is designed based on AECQ-200. Antenna is measured in resonant mode. The specification chart is a reference guide for the most common required values at working frequencies of 125 kHz, 20 kHz and 134.2 kHz. Any other inductance value at LF or tighter tolerances can be provided. Please contact our sales department for any inquiry. o Receiving the signal from the probe field with the spectrum analyzer.